Cell membrane plays critical cellular functions in both physiological and pathological pathways and thus is important target for both basic and applied biomedical research. The domain structure features of cell membrane strongly affect the functions of membrane embedded biomolecules such as proteins and carbohydrates. However, understanding the structural aspects of membrane effects on the embedded biomolecule’s function have not been able easily to do due to limited approaches available. We have engaged in fabrication of cell membrane mimetic systems for functional analysis of membrane proteins and cell surface carbohydrates [1,2]. 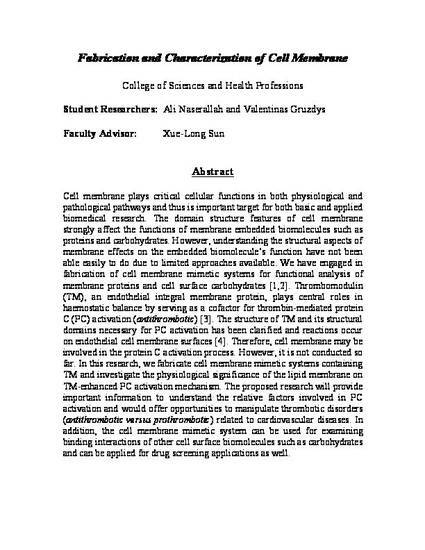 Thrombomodulin (TM), an endothelial integral membrane protein, plays central roles in haemostatic balance by serving as a cofactor for thrombin-mediated protein C (PC) activation (antithrombotic) . The structure of TM and its structural domains necessary for PC activation has been clarified and reactions occur on endothelial cell membrane surfaces . Therefore, cell membrane may be involved in the protein C activation process. However, it is not conducted so far. In this research, we fabricate cell membrane mimetic systems containing TM and investigate the physiological significance of the lipid membrane on TM-enhanced PC activation mechanism. The proposed research will provide important information to understand the relative factors involved in PC activation and would offer opportunities to manipulate thrombotic disorders (antithrombotic versus prothrombotic) related to cardiovascular diseases. In addition, the cell membrane mimetic system can be used for examining binding interactions of other cell surface biomolecules such as carbohydrates and can be applied for drug screening applications as well.